Two species of gliders (Pantala sp.) 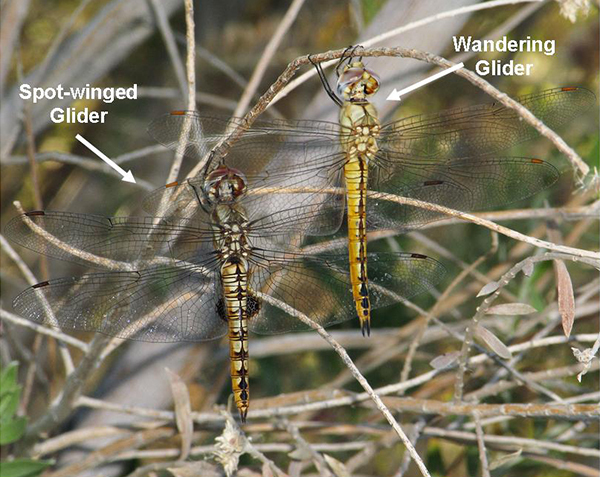 are commonly found in Arizona: the Spot-winged Glider and the Wandering Glider. The two species are of similar sizes and spend much time on the wing. They perch vertically and by hanging up in bushes, etc (see pictures). Within each species, males and females look very similar. To separate the two species, focus on the overall color and wing pattern. Wandering Glider: yellowish-orange with yellow/orange face. Wandering Glider: wings are clear. Spot-winged and Wandering Gliders, Wild Horse Pass, Maricopa, AZ, 5 July 2010.